Background There are significant research gaps into understanding the extent of medication errors within mental health and variation in the uptake of standardised medication safety practices. Long-acting injectable antipsychotic (LAIA) preparations are a common treatment modality for the administration of antipsychotic medicines. Aim of the review To examine the literature on medication-related errors and practice issues associated with the documentation and administration of LAIAs. Method Electronic databases were searched for articles exploring medication errors in mental health, charting and administration of LAIAs, standardised medication charts, documentation of LAIAs and strategies or interventions to improve medication safety with LAIAs. Results Nineteen articles met the inclusion criteria. 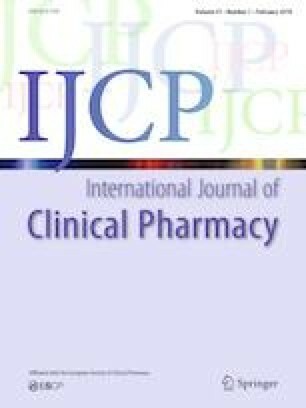 Medication errors in mental health were mostly related to the clerical or procedural aspects of prescribing. Standardised charts have been shown to reduce prescribing and administration errors. Divergent practices across mental health services were reported and this lack of standardisation in ordering and administering LAIAs contributes to errors. Discrepancies between guidelines and current practice with the administration of LAIAs were also identified. Evidence demonstrates that clinical pharmacy services reduces medication errors, and increased pharmacist involvement in LAIA care coordination improves communication and documentation with LAIAs. Further investigation focusing on standardisation of charting, administration and documentation of LAIAs is required. Conclusion Limited studies were identified that assess the charting, administration and documentation of LAIAs. Future research is required to review current local practices with LAIAs and identify substandard areas so that specific clinical interventions can be implemented and evaluated. The online version of this article ( https://doi.org/10.1007/s11096-019-00814-6) contains supplementary material, which is available to authorized users. This literature review was undertaken as part of the Monash Master of Clinical Pharmacy coursework and extensive feedback was received from Monash University unit coordinators and academics. The authors also wish to acknowledge Anita Abarno, Associate Director of Pharmacy Services, Royal Adelaide Hospital for reviewing the manuscript. The authors whose names are listed on this manuscript certify that they have no financial or other affiliations to declare that might lead to a conflict of interest. Australian Commission on Safety and Quality in Health Care. Available from: https://www.safetyandquality.gov.au/publications-resources/publications/ (last accessed 06/02/19). Australian Commission on Safety and Quality in Health Care—National Inpatient Medication Chart User Guide (2016). Available at: https://www.safetyandquality.gov.au/wp-content/uploads/2016/03/NIMC-User-Guide.pdf Accessed 04 April 18.